The granite monument commemorates the 1956 Olympic Torch Relay run between Cairns and Melbourne, between 9th and 22nd of November 1956. As host city for the beginning of the 1956 Olympic Torch Relay, the 1956 Olympic Torchbearers Club Inc (Cairns) was founded to create a club for the 1956 runners. 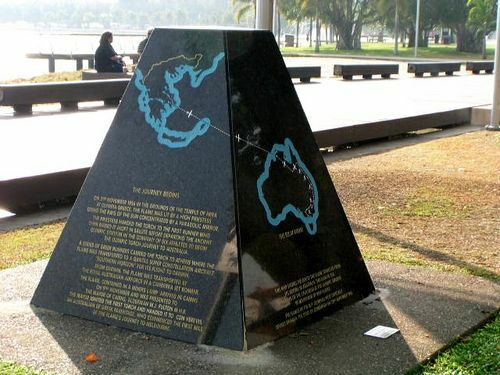 This Memorial Is Dedicated To The City Of Cairns As Host City For The Beginning Of The 1956 Olympic Torch Relay. At The Time, The Relay Was The Longest Ever Undertaken In The Modern Olympic Era A Distance Of 2855 miles (4600km) And The First In The Southern Hemisphere. The Memorial Commends The Alderman, Councillors And Staff Of Cairns City And Mulgrave Shire Councils And Other Community Leaders For Their Dedication In Securing Cairns As The Starting Venue For This Historic Event. Their Foresight Placed Cairns On The International Stage At A Time When The District Was Relatively Unknown. This Memorial Also Honours The Runners Who Each Carried The Flame Over A Mile (1.6km) Distance Inside Seven Minutes On Its Non-Stop Journey To Melbourne Over 13 nights And 14 days And The Assisting Personnel.